Sarcasm isn’t a crime-so we’re continuing this weekly round-up of nutty tales. 1. COMEDIAN-SENATOR TITO SOTTO SAYS HE’S GOING TO HAVE THE LIBEL LAW "REMOVED" ENTIRELY SO HE COULD TRADE BARBS WITH HIS CRITICS. Pope John Paul II said, "Stupidity is also a gift of God, but one mustn’t misuse it." 2. 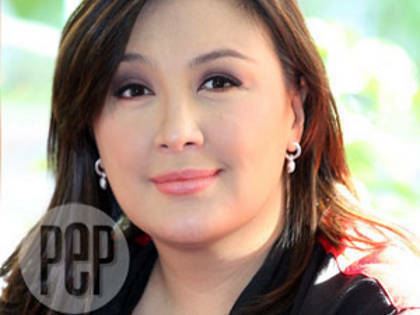 SHARON CUNETA-THE NIECE OF SOTTO’S WIFE HELEN GAMBOA-SUPPORTS THE CYBERCRIME PREVENTION ACT OF 2012 AND SOTTO’S INSERTION OF THE LIBEL CLAUSE. To paraphrase former French president Jacques Chirac, "There are people who often miss the great opportunity to shut up." 3. CIARA SOTTO, DAUGHTER OF COMEDIAN-SENATOR TITO SOTTO, EXPLAINS WHY WE NEED THE CYBERCRIME PREVENTION ACT OF 2012. Ponder on the words of English historian Thomas Fuller: "Admiration is the daughter of ignorance." 3. STEPHEN MICHAEL BACOSA-THE NEPHEW OF COMEDIAN-SENATOR TITO SOTTO’S WIFE HELEN GAMBOA-SENDS A FACEBOOK PRIVATE MESSAGE TO MUSICIAN ADRIAN ARCEGA TO MAKE IT CLEAR THAT HE’S A "BULLY IN THE REAL WORLD." How can we not love a man who takes so much pride in his...er...talent? 5. BOXER-LAWMAKER MANNY PACQUIAO WANTS TO BE REELECTED AS SARANGANI CONGRESSMAN, WHILE HIS WIFE JINKEE WANTS TO BECOME SARANGANI’S VICE GOVERNOR. Heck, if we can let jokers loose in the Senate, surely we can let the woman have her shot at public office. <>7. DINGDONG DANTES SAYS HE AND MARIAN RIVERA ARE HAPPIER THAN EVER DESPITE RUMORS LINKING HIM TO ISABELLE DAZA. In the spirit of being positive, we shall take your word for it. <>8. 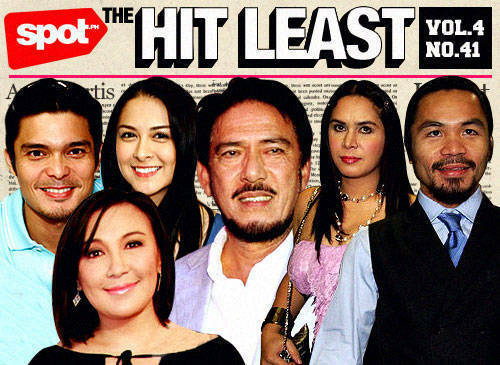 MANNY PANGILINAN WON’T BE BUYING GMA NETWORK INC., AFTER ALL. Ahhhhh, rich guy problems! <>9. 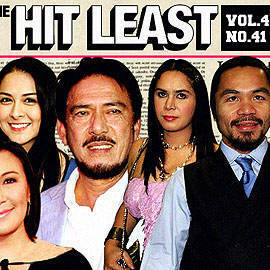 NANCY CASTIGLIONE SAYS SHE REALLY HAD NOTHING TO DO WITH THE DR. VICKI BELO-HADEN KHO JR. SPLIT. Then you’ll be happy to know that we’ve already filed this under Miscellaneous Issues. <>10. PUBLIC OFFICE ASPIRANTS FILE THEIR CERTIFICATES OF CANDIDACY, SOME WITH FANFARE RIVALING THAT OF MOVIE STARS. Kids, lock your doors...the circus is back in town. <>Art by Warren Espejo, with photos from PEP.